Hello! I am taking a break from holiday cards to make a birthday card using the Sketch Challenge #N2515 from The House That Stamps Built. I heat embossed a Birthday Sentiment from Repeat Impressions with Gold EP and attached to mats of Gold Metallic CS and Blue CS. 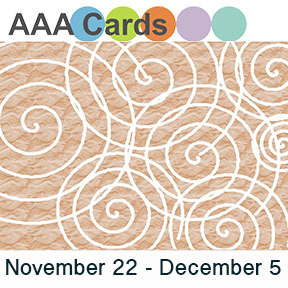 I use the same Blue CS as the card base and layered with a Gold Foil accented Pattern Paper. 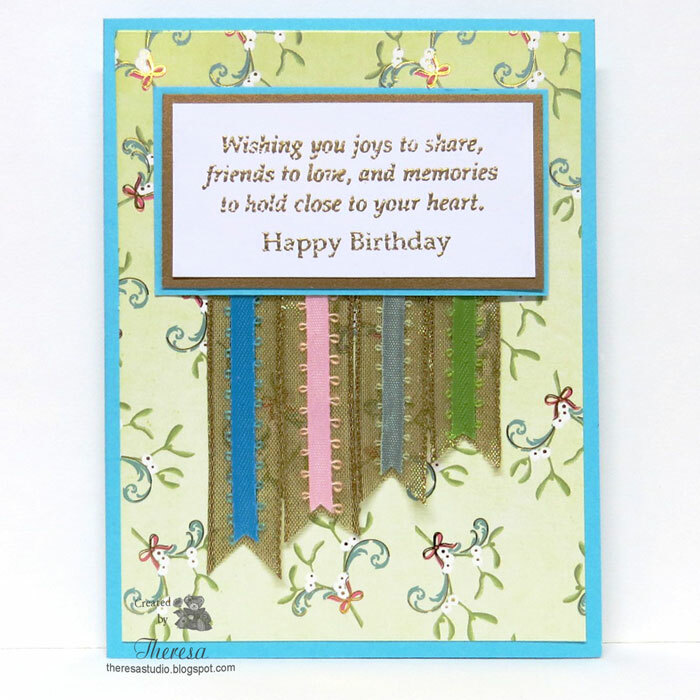 I selected 4 colors of Looped Ribbon ( from colors in the paper design) to use with Gold Metallic ribbon to complete the card. The House That Stamps Built: What If? Wednesday Sketch shown on right. Hello! 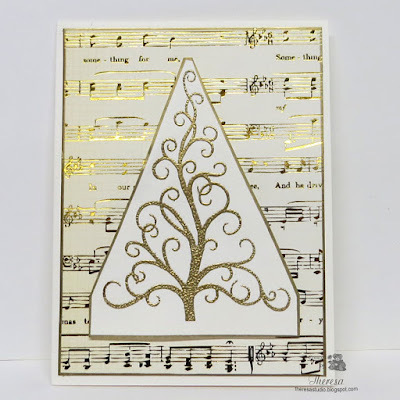 I have been playing again with this Tree stamp from GKD Joyful Holiday set. 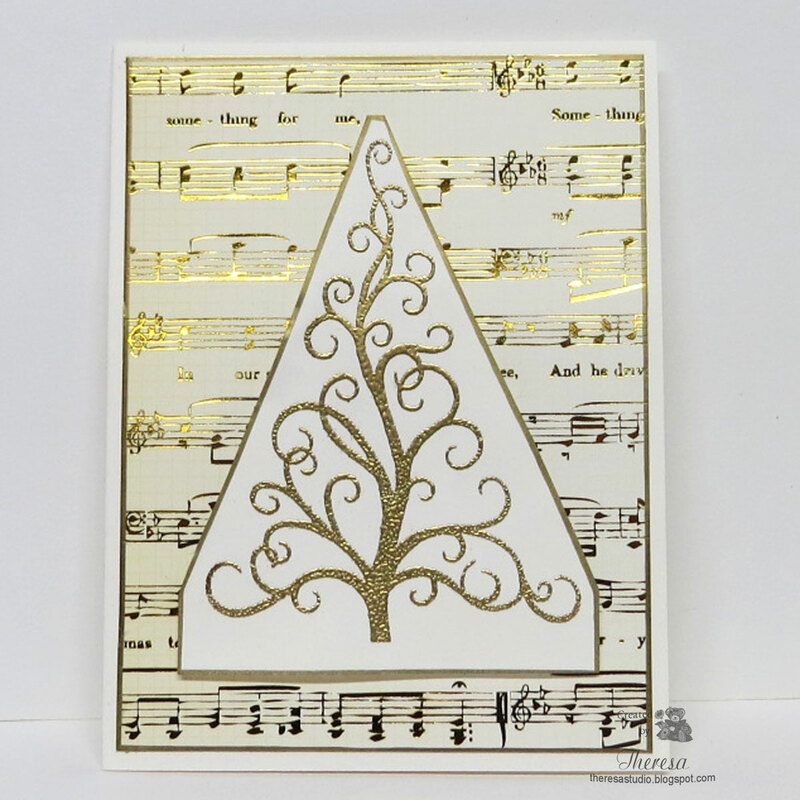 I love the way that this looks with Gold Embossing and paired it up with a gold foil accented pattern cardstock on an Ivory card base. To add more gold I edged the layers with Pilot Metallic Gold Marker. Easy Peasy! Stamp TV: Mix It Up Monday challenge-Use only one Stamp and make it the focus. Hello! Happy Saturday! Did you go shopping yesterday? I spent the day at home and only shopped online. After many years in retail stores, I certainly have no desire to venture out shopping on the day after TG. 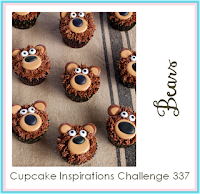 I have a card for Cupcake Inspirations Challenge #337 with the theme of Bears....you know how I love Bears so I had to enter this but time is running out. I used a Crafty Sentiments Digital image Bear with Sled printed on Water Color Paper and colored with Copics and Glaze Pens and added some Sakura Stardust glitter. Heat embossed some snowflakes since he needed them for his sled. Sentiment from MFP was heat embossed with Zing Chestnut EP. Papers from stash including the pattern from Fancy Pants. Hello! I was playing with the sketch from Tuesday Morning Sketches and flipped it on its side. 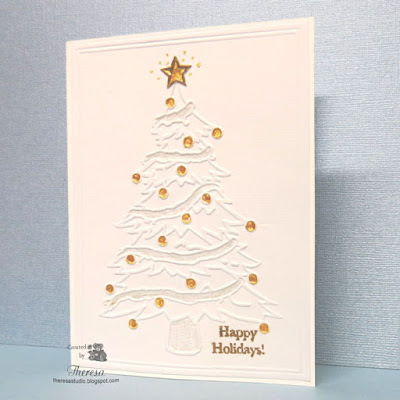 I stamped the tree from GKD Joyful Holiday and embossed with Gold EP. 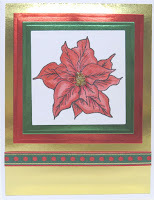 I trimmed to a triangle rather than using as rectangle and popped up on strips of red and gold foil cardstocks. 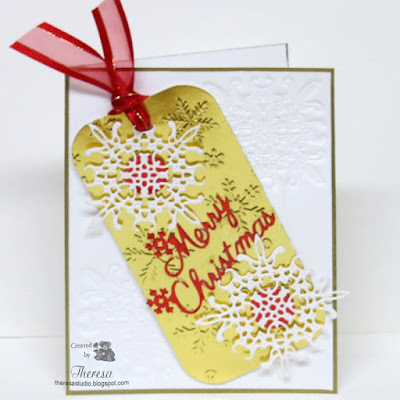 The card base is a metallic gold CS layered with pattern paper from stash. 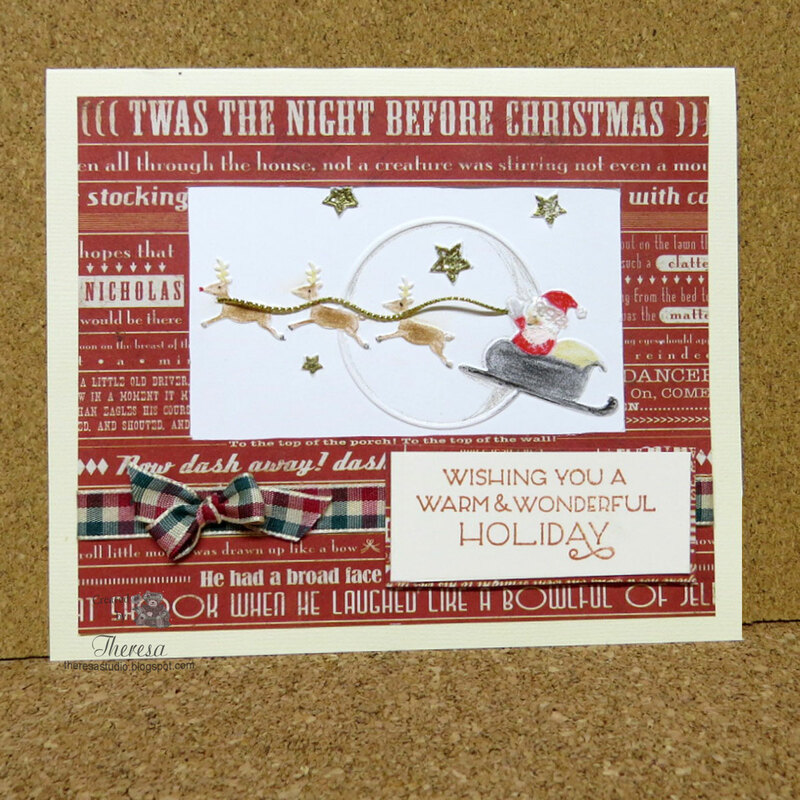 Used Cuttlebug EF Divine Swirls and Christmas Words EF (freebie). This is a different design than I usually do ....was using items already on my desk to create. 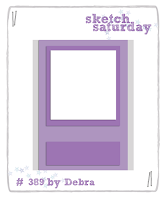 Tuesday Morning Sketches: #328 shown below. I have been playing with some DCWV solid Foil Cardstock. I love how elegant foil is but it is the hardest thing to photograph. I hope you can sense how this card looks in real life. Did a closer look to show foil layers better. 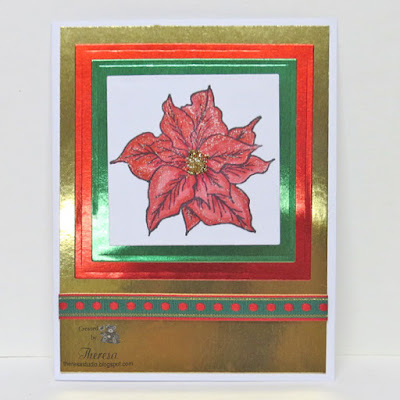 The Poinsettia Stamp is from GKD A Year of Flowers set and is one of my most used stamp set. I stamped with Memento Black ink and colored with Copics and added sparkle with Sakura Stardust pen and Stickles Gold Glitter glue. 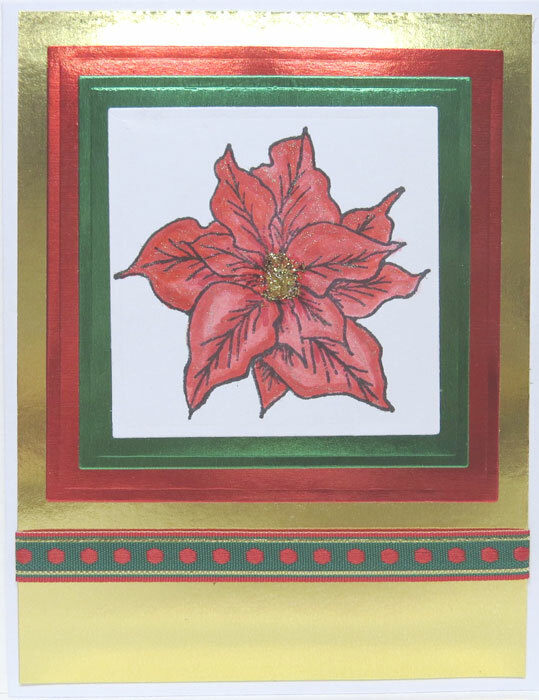 I matted the single image on Squares of Red and Green Foil and the a Gold Foil before attaching to the card base. I found the red, green, gold ribbon in my stash which was never opened. 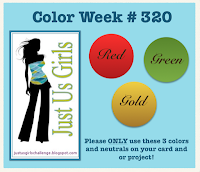 Stamp TV: Mix it up Monday Challenge-Use a single stamped image and make that the focal of card. 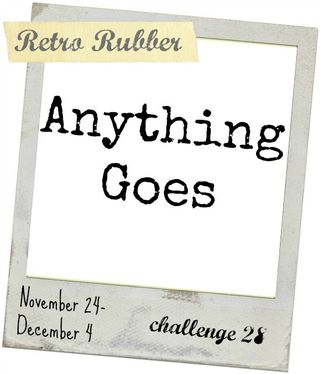 Retro Rubber : Challenge 28 Anything Goes. The poinsettia stamp is one of my favorite. Used it for several years. Cards in Envy: Put some extra layers on. Layered with Foil CS. Hello! I have been "experimenting" with different versions of a Christmas card made with a Cottage Cutz Dove cut out that I have had a number of years. These cards were very quick to make....it took me longer to find where the die was in my studio than it did to make all the cards. The top card has the blue card base with a layer of watercolor paper that I sponged with DI Tumbled Glass. The Dove was cut from plain white CS. The Power Poppy sentiment is stamped with DI Broken China. 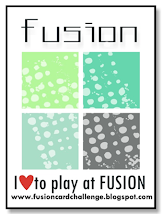 The second card is the same as the first but I added the sprig of green cut with the same die. 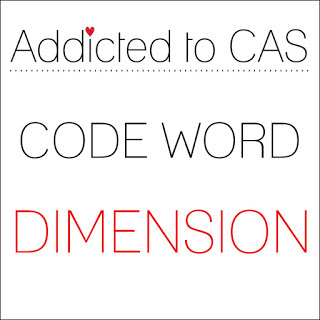 Addicted to CAS: #77 Dimension....Dove popped up for dimension. 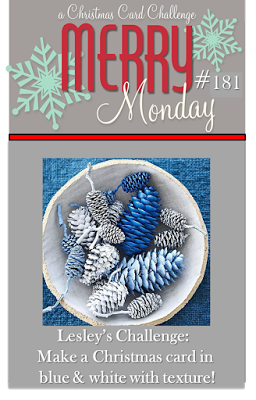 Merry Monday Christmas Challenge: #181 Blue and White with Texture. The bottom card has the most texture of the ones shown. Shopping Our Stash: #229 No stamping. Bottom card has absolutely no stamping. This third card has the same card base but the white layer is White CS that I water colored with DI Tumbled Glass. I like the background that this made for the Dove cut from Watercolor paper which has a nice texture. I stamped this card with a Spellbinders sentiment also in the DI Broken China. I am not sure why I water colored on the plain CS but sponged ink on the watercolor paper. It seems I should have done that in reverse but I liked the results. Maybe the next time I will do that. 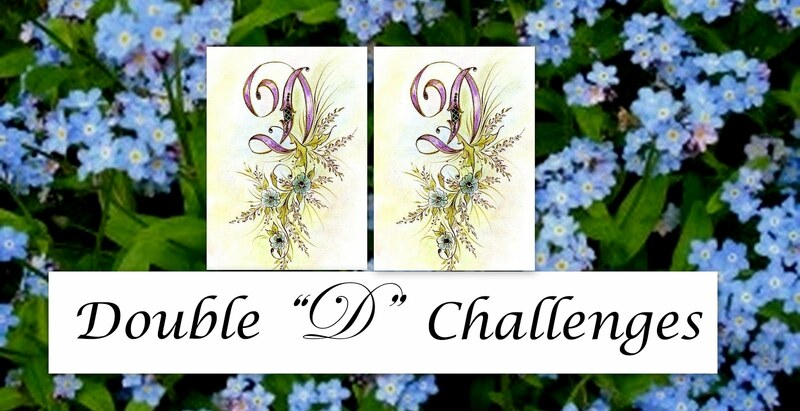 The bottom card is with a White Card base and a Blue CS layer embossed with CB EF Divine Swirls. 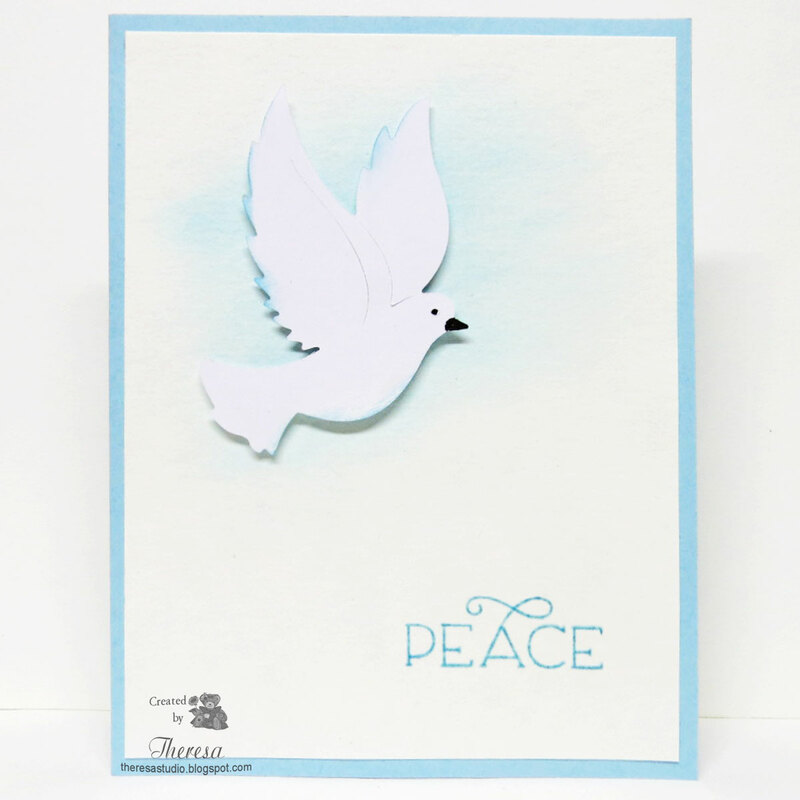 The Dove is cut from a White Textured CS and centered on the card. All Doves where attached with pop up tape. I think using foam cut with the die would work really well but I do not have any white foam. The sentiment Peace on Earth was cut from an embossed border of Glossy White CS with Christmas words. No stamping on this card. Hello! I am back with some more cards for some challenges about to close. So this will be a quick and short post. The first card was made with Die Cut Silver Snowflake that I had in my leftover stash and I have no idea where it came from or the die used. 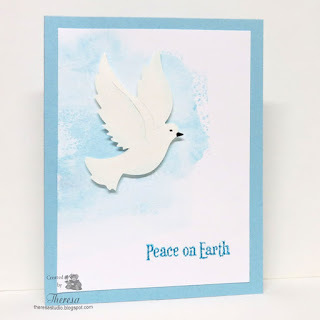 I just attached it to Bazzill Blue Card base embossed with Cuttlebug EF Snowflakes that I inked with Brilliance White ink. Finished with an Annabelle sentiment stamped and embossed with Silver EP on vellum and fancy cut. 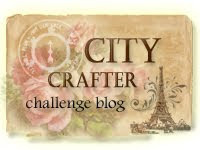 City Crafter Challenge Blog: #288 Color Challenge on left. 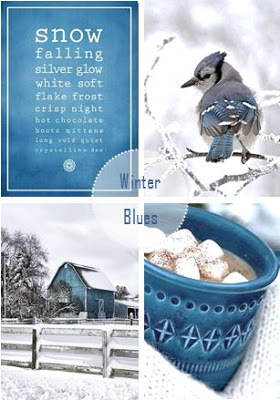 Inspired by snow and blues. This second card was created with white textured CS embossed with a Darice EF Christmas Tree. I simply added Gold Liquid Pearls to the stars and ornaments with some Sakura Clearstar sparkle. The GKD sentiment was heat embossed with Gold EP. I attached this to a White Card Base. 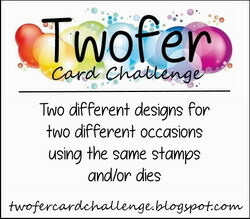 Clear It Out Challenge: Theme is Colour challenge-white +1 colour Stash: Your choice ( card must be mostly white). Used gold with white. Hello! 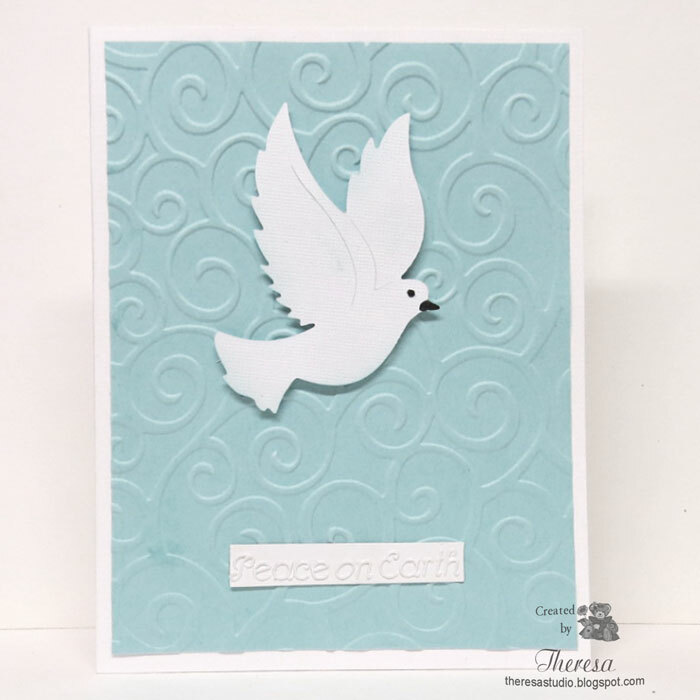 I have another card that I made after watching a video by Jennifer McGuire on making monochromatic cards and layering stamps. I decided to make a Christmas theme card using several clear stamps from GKD Joyful Holiday and Memento Red inks. Other Supplies: White CS, Red CS, Vellum, Brilliance Moonlight White ink, Versamark, White EP, Red Copic Marker, White Gel Pen, Vellum Tape. 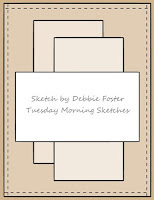 Mod Squad Challenge Blog: Pattern your paper-create your own patterned paper. Second entry. Hello! 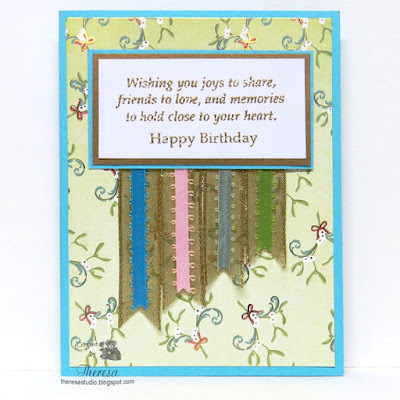 Today I am sharing a card that I made using an already colored Dearie Doll digital image. 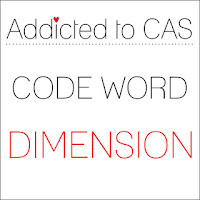 Uncolored images are also available but I went the easy (lazy) way and the colors are so bright and perfect. 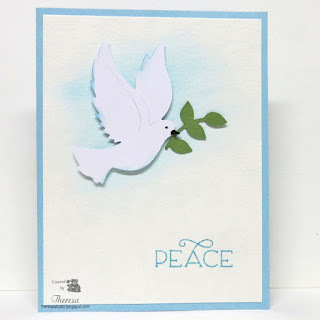 This card was so easy to create I almost feel guilty that I did not work that much. I simply printed the image on white CS and trimmed with Spellbinders Divine Eloquence die and placed on a orange mat and then a brown CS base. 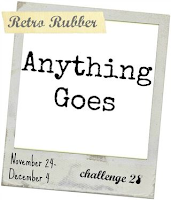 I stamped the MFP Happy Thanksgiving with Memento Rich Cocoa ink. Even the die cutting was easy since I used dryer sheets with my die and the pieces popped right out. Have you tried that easy step? Cards in Envy: Put some extra layers on. 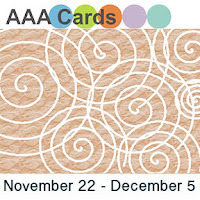 My card does not have that many layers but the image is wearing a jacket. Die Cuttin Divas: #242 is Thanksgiving. Used Spellbinders Die. 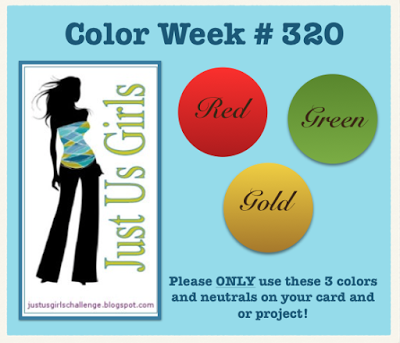 Tuesday Throwdown: #271 challenge is Shopping Spree. My card shows some Pumpkin Shoppers. Shopping Our Stash: #228 Challenge is make a Thank You or Thanksgiving. 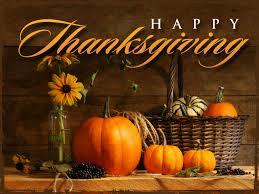 Wishing everyone a great and blessed Thanksgiving! Welcome! Christmas is quickly approaching and soon it will be the night before Christmas. I have cut a frame in a pattern paper from stash and used a embossing folder to create the image to place inside. The embossed image was colored with pencils and gold glitter and white Stickles. I added some plaid ribbon and bow and a sentiment from Power Poppy stamped in Memento ink. The card base is a textured ivory CS. I thought the text in the paper added to the theme of the card. Hello! Today I have a scenic card which I have not made in awhile. 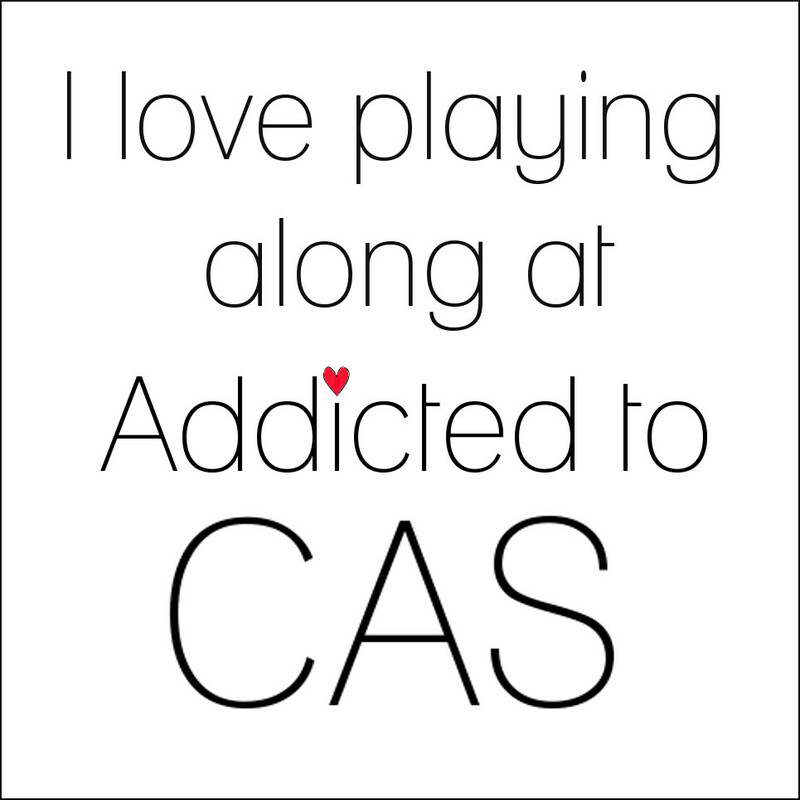 But I love creating them because I am never sure as to how they will turn out. My inspiration is from the Photo Challenge N1815 at the House That Stamps Built (shown on right). I made this card using Repeat Impressions stamp Rocky Shore Vista which I stamped on White CS with Memento Black ink. 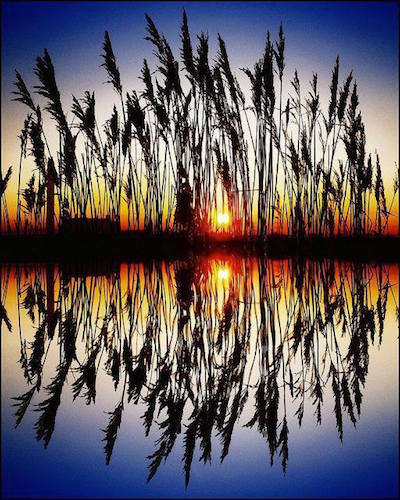 I created the scene by sponging layers of colors on the sky and water. I colored the images all black because I wanted it dark. 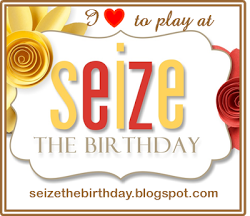 The sentiment also from Repeat Impressions is a portion of a verse as I only wanted it to read Happy Birthday. I stamped it with black ink and heat embossed with Clear EP----I do that a lot lately as it makes the words show up shiny. Supplies Used: Distress Inks Squeezed Lemonade, Spiced Marmalade, Spun Sugar, Stormy Sky. Memento Summer Sky and Tuxedo Black ink, Pencils, Bazzill Blue Textured CS, Black CS, Black Micron Pen. 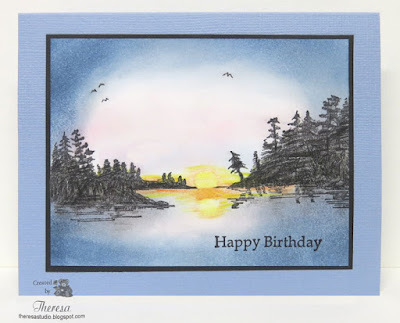 Below is a second version of this card.....on watercolor paper. 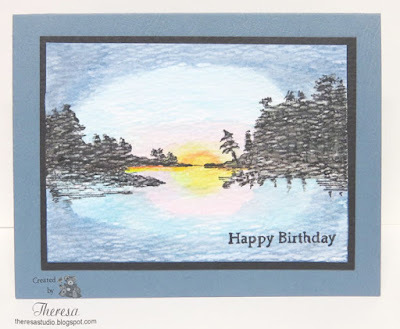 I water colored the background first with the distress inks and then stamped the Rocky Shore stamp using the Misti to line the stamp up. I finished this one in the same way but used a darker blue card base. 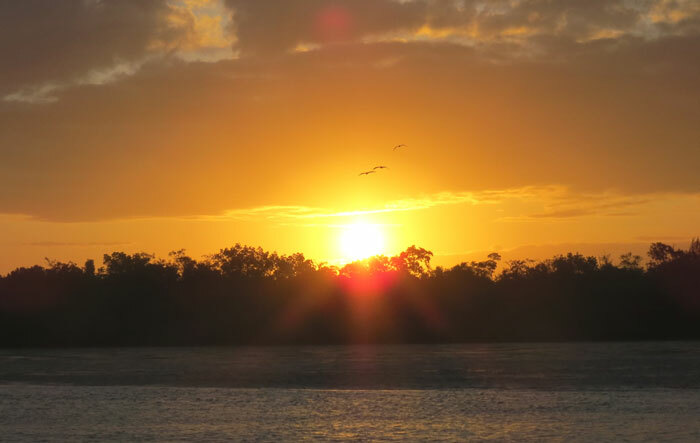 This one is more artistic with an impressionist feel. Do you favored one over the other? 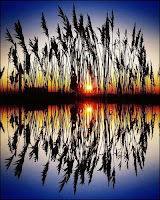 Is my card a sunrise or sunset scene? I had a sunrise in mind as I created this card but my DH said that it looks more like a sunset! I guess it could be either...just determine if you are looking to the east or the west. which has more orange and red but I was also thinking of this when I made the card. Hello! Today, I am thrilled to be a Guest Designer at Tag YOU'RE It! Challenge. I have only recently found this fun challenge and love their inspirations and making tags for their challenges. 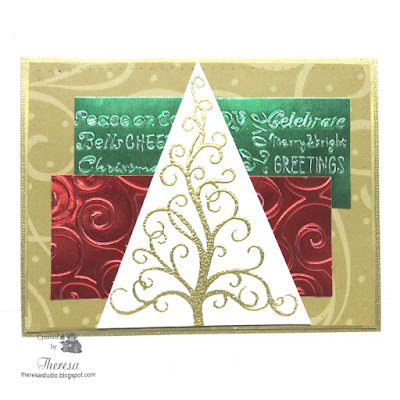 This week's inspiration for Challenge #35 is by Tracey and is a great Christmas design. 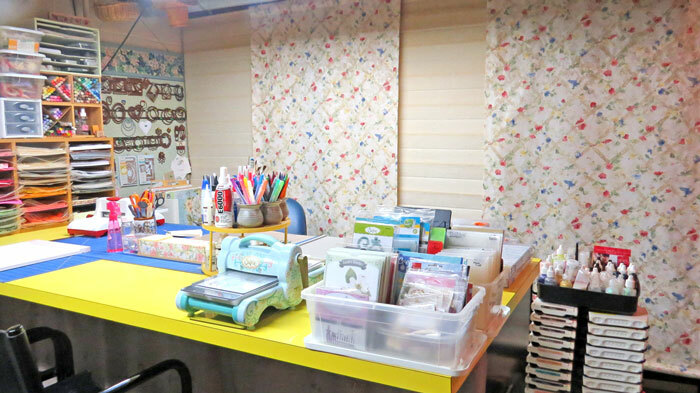 I was inspired by her use of Pattern Papers and great die cuts. 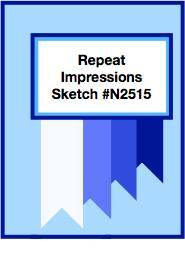 I hope you will be inspired to play along and have a chance to be a Guest Designer. For my tag, I decided to also focus on pattern papers (just love playing with patterns) and I stayed with a Christmas theme. 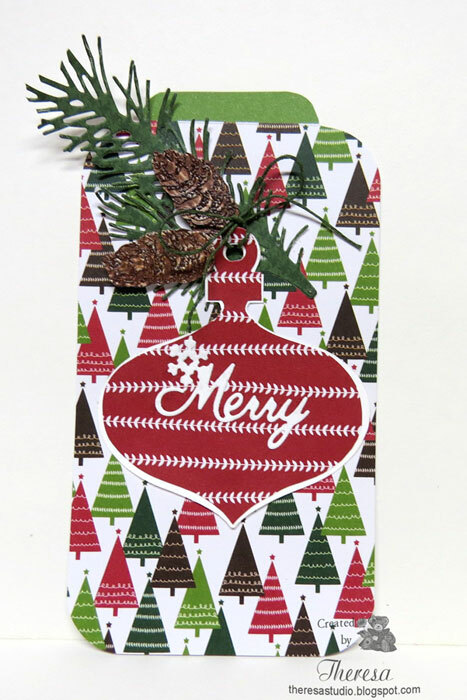 I chose pattern papers from Pebbles Welcome Christmas pad with similar colors and used a Impression Obsession Branch die, a Cuttlebug Ornament die, and a Cheery Lynn Die for the word Merry. I heat embossed some Pinecones using a GKD stamp and Zing Chestnut EP and fussy cut them after coloring with Copics. I assembled all my elements together and added a bow of green twine to complete the tag. 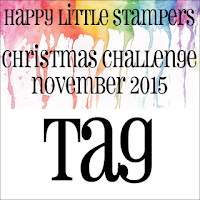 Craftyhazelnut's Christmas Challenge: #255 Red and Green must be seen. Thanks to Tracey and the TYIC team for inviting me to join them as a Guest! Hello! 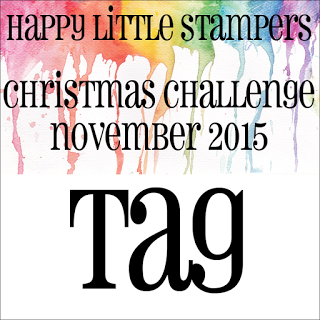 Today I am showing a Tag made for Cheery Lynn Challenge # 211 To Make a Tag. 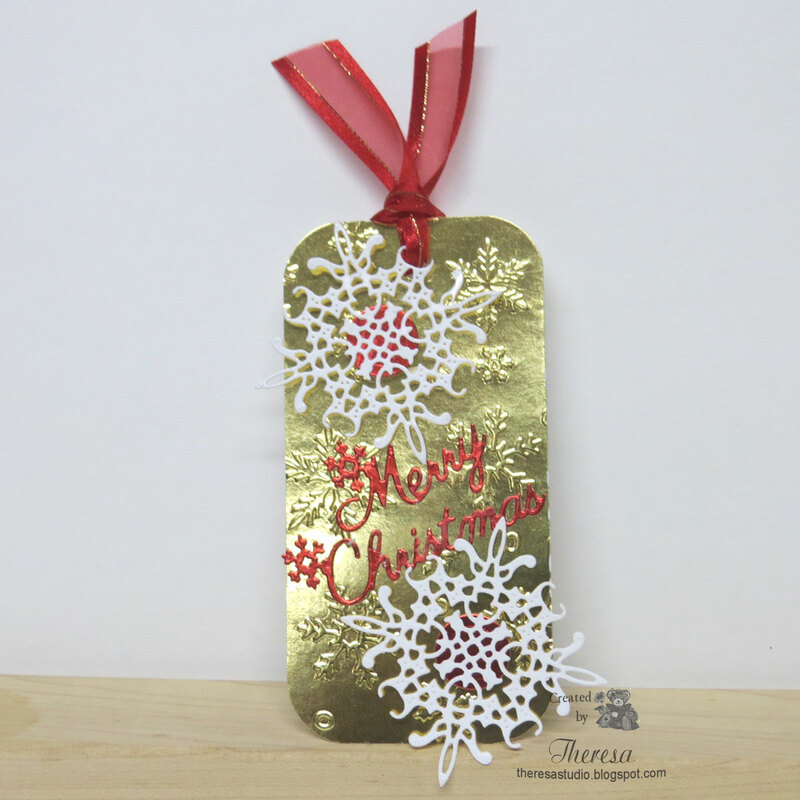 My design is CAS using gold Metallic Paper for the tag that I embossed with Snowflakes. 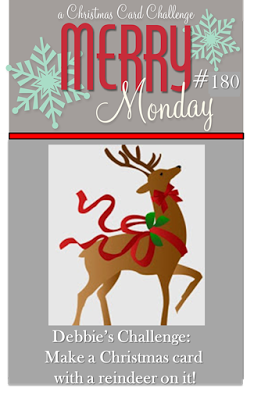 I attached White Snowflakes die cut with Cheery Lynn Snowflakes 3 and Merry Christmas die cut with Cheery Lynn dies in Red Foil. 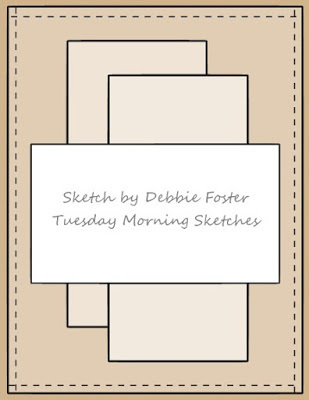 I decided to make a card by attaching the above tag to a white card base. 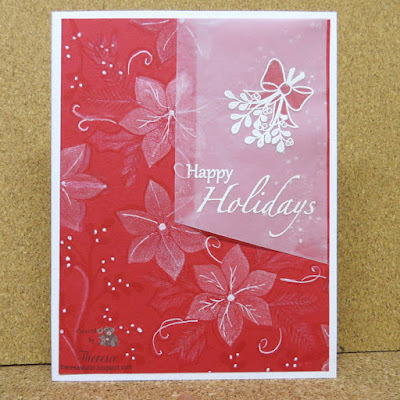 I used the Cheery Lynn Snowflake 3 die to embossed 2 corners of the card base. I also edged the card with a Pilot Gold Marker. Hello! This is a card that I made after watching a video by Jennifer McGuire on making monochromatic cards and layering stamps. I loved her cards and just had to give this technique a try. This is one of the results from my trials. Supplies used: Verve stamps from Nature Walk and Fabulous You, Yellow and White Cardstocks, Memento Tangelo Ink, White Gel Pen, Vellum, Versamark, White EP, Die Cut. 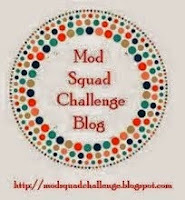 I thought this would fit the challenge at Mod Squad Challenge Blog this week-Pattern Your Paper. 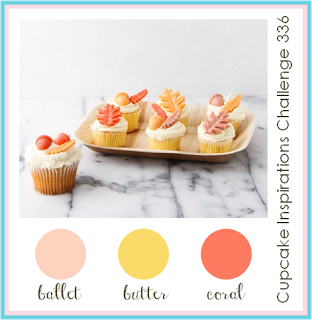 Cupcake Inspirations: Challenge 336 Colors Ballet, Butter, Coral-inspired by colors and also acorns and other shapes from nature as in photo.